Royal Purple’s Nitro Plus Oils are straight-grade synthetic motor oils formulated specifically for use in blown alcohol, nitro-methane or any racing applications that experience excessive fuel dilution. Designed to withstand even the most severe stress in high-compression engines, Nitro Plus oils outperform all other high performance synthetic oil on the market. And their non-foaming formula provides optimal protection against engine rust and corrosion. 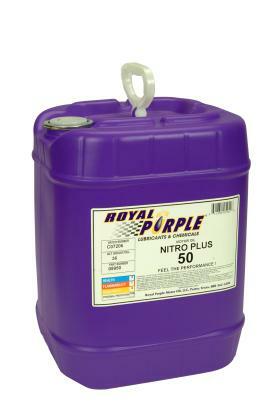 Please consult Royal Purple’s Technical Department at rpautotech@royalpurple.com when choosing the racing oil for your specific application. Viscosity typical of an SAE 50 oil. Viscosity typical of an SAE 60 oil. Viscosity typical of an SAE 70 oil.